Call Me On The Yacht: What Would Betsy Ross Think? What Would Betsy Ross Think? 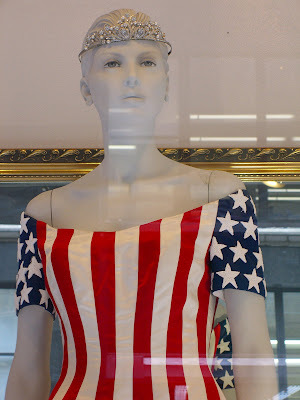 This dress above (displayed because of the recent Fourth of July holiday) in a Garment District shop on West 38th Street would have been awesome on Hillary (even though I'm down with the 'bama). Well ok not really, as she doesn't have the stature and svelte little waist that the stripes seek to highlight (and having met her in her senatorial digs once, I sure felt about a foot taller). In any case, I totally remember seeing a picture of her waltzing with Bill at his first inaugural ball in 1992 while wearing a purple crystal-encrusted gown. I remember not so much because it was gorgeous (which it was not) but because it was just a lot of purple and sparkle and I was young. 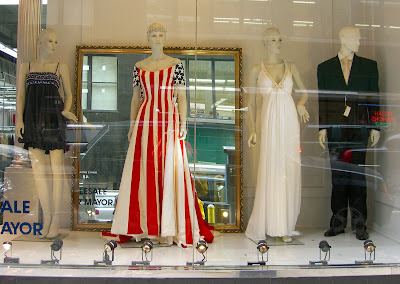 The older me is now attracted to primary, bold colors and thus I am strangely drawn to this ode to America. Just one question: what is up with the tiara? Loyalists!